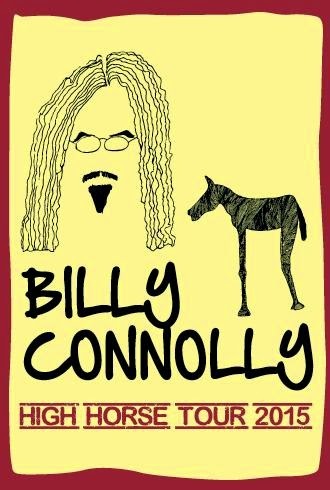 I was lucky enough to see Billy Connolly's latest live show, High Horse Tour, at the Adelaide Entertainment Centre, thanks to my partner who managed to score some half price tickets. I've been a fan of Billy for as long as I can remember and have owned various recordings of his live shows and TV series on VHS tapes - most of which I don't own anymore because I did a purge of 'old tech' that I didn't want to be hoarding when I no longer had a VHS player. I never thought I'd ever get to see him live and, if you're thinking the same, do your best to go see him this time around if you can, because there's probably not going to be too many more opportunities. I can say that because right out of the gate Billy opened his show with the statement "You're only applauding because I might die!" It's funny and said as a joke but there's no getting around that Billy is definitely slowing down as a result of the onset of Parkinson's disease that he was diagnosed with some time back (not to mention his age in general). Previous tours he's moved around the stage considerably more and been much more animated retelling various stories. This time around he seemed much more measured and only really moved around if a story required some visual demonstration. Having said that, no one tells a funny story quite like Billy. He held the capacity audience captivated for a full two hours that only seemed like half that time to me. The show is a bit of a mixture of old and new much of it still drawn from his Scottish roots but he also talks about some of his experiences making films and still manages to throw in some local humor about current events. His personal thank you to our Prime Minister for Awarding Prince Phillip a medal was a particular highlight. Me, being a bit of a movie buff who loves to hear the behind the scenes stories and, having just seen the last installment of The Hobbit (Battle of the Five Armies) in which Billy plays a Dwarf leader, I would liked to have heard about his more recent movie experiences. However I wasn't disappointed with those insights he did talk about, such as his role playing a bad guy who had to unload rounds from 6 machine guns strapped to his front. Billy unapologetically uses some very strong curse words in his show, even features them as part of a story. He states from the beginning that he's going to ramble on and probably lose his place too - which he does, leading to some great audience interaction. All of which is classic Billy - he was rambling and losing his place long before the Parkinsons. The only real down side to a Billy Connolly show is the abrupt ending. Even though he warns that he's about to tell you his last story, you can't help but wish he would come back out when it's finished and tell just one more story. He's just that captivating. Go and see him if you can.